"The first thing that you discover when you encounter Atomic Chamber Ensemble is that they are impossible to classify. All the categories we rely so heavily upon to guide us to music we like when we visit our favorite music store or online vendor… useless. Six acoustic guitars. Their promotional material alludes to “a rich tradition of interactive music making, with material ranging from highly intricate compositions to playful circulated improvisations, from explosive harmonic polyrhythms to haunting melodies that take the breath away.” And it is all true. Rather than try to play down their range and scope they have chosen to embrace and celebrate it. The very name of the group is a whimsical response to this conundrum. How many times can you be asked, “what kind of music do you play?” before you are forced to come up with some kind of answer? Their standard response became “we play atomic chamber music!” Delivered with a smile, it was evocative and inexplicably accurate, without actually saying anything. It conveyed a feeling for what the band was about. That was generally sufficient, and a name was born. Scan the track listing on the back of their latest CD, “King for a Day”, and the only immediate points of reference are a Mahavishnu cover and a Shostakovich prelude. For those keeping score, that’s one 70s jazz fusion classic and one slightly obscure 20th Century piano work. Press the “play” button, and the tapestry only gets richer. Cultivating the Beat, the opener, romps and bounds through contrapuntal symphonic changes. Sigh and a Kiss follows with a lovely and modern harmonic and melodic structure, punctuated by a massive rock and roll interlude, and culminating in an improvised recapitulation. 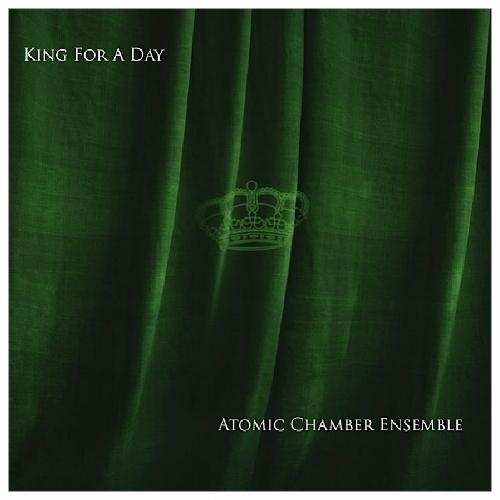 The title composition, King for a Day, follows, with its eastern-tinged structure and extended improvisations. And then… the first of several pieces, simple melodies, cryptically referred to as a “Circulation.” And so it goes. While the band may be a marketing department’s worst nightmare, their audiences have never had any difficulty recognizing what it is that makes everything they do so uniquely and unmistakably Atomic Chamber Ensemble. The principle is… if they are successful in engaging their own interest and entertaining themselves with this music, their audience will be engaged and entertained as well. And, when an audience is engaged, the stakes go up, and the players must rise to the occasion. This is the Atomic Chamber Ensemble recipe: play the music and trust the audience. Magic happens. Whether in the homey intimacy of Honey Bear Café at Third Place Books, the majesty of the great hall at the Seattle Art Museum, or the calculated mayhem of Northwest Folklife and Bumbershoot, live Atomic Chamber Ensemble is something that simply must be experienced. No “guitar god” pretensions. No leaping about, no prancing, no windmills. Instead, they sit on stools in as close to a semicircle as circumstances allow, and turn out beauty and stunning virtuosity without drama. And it is in the live performance that the vivifying power of the music fully reveals itself. The “circulation” that on the CD is experienced as a lovely melody is revealed to be fantastically improvised, with each player contributing one note at a time – a kind of group mind and group creativity that no one player can lay claim to. Circulations, both improvised and composed, are weaved throughout their repertoire, and are both a reflection of and a source for the unique vivaciousness of Atomic Chamber Ensemble music." "Atomic Chamber Ensemble has been performing in and around Seattle since 1998. Jaxie Binder, Chris Gibson, Curt Golden, Dean Jensen, Travis Metcalf and Bob Williams; guitarists all, who descended on Seattle in the late 90’s. Curt, Bob and Jaxie moved out from New York City in late 1997, looking for a change of scenery and the opportunity to work together. At about the same time, Chris moved to Seattle from Utah to attend Cornish College of the Arts. Dean and his family came in from Chicago in early 1998. Travis began commuting from Portland in order to take lessons from Curt and to take part in the growing guitar community in Seattle, and soon made the move. The common ground for the group is Guitar Craft, an approach to music founded by King Crimson guitarist Robert Fripp. Curt, Bob and Dean attended early Guitar Craft courses in the summer of 1985. Curt and Dean toured together as part of the League of Crafty Guitarists from 1986-91. Curt is a Guitar Craft Instructor and Mentor. Jaxie’s first Guitar Craft course was in 1990. She and Bob (eventually, her husband Bob) formed The Wilsons, which performed in Europe as part of the Guitar Craft explosion that was taking place there in the early 90’s, as well as back home in New York. Bob, Jaxie and Curt worked together in several Guitar Craft-related guitar circles in NYC. Chris and Travis first directly encountered Guitar Craft in the form of the Seattle community. For several years a number of “Crafty Guitarists” had been settling in the Seattle area. The community there was vital, creative and growing. And so, in 1997/98 the future members of the Atomic Chamber Ensemble all found themselves migrating to the Northwest to be a part of that community. In 1998 Jaxie, Bob, Curt and Dean, along with fellow founding members Steve Ball and Bill Rieflin, began performing in and around Seattle under the name Seattle Guitar Circle, and that group released their first CD entitled “Twilight” in 1999. In 2003, as they were commencing work on their second CD, Bill and Steve had moved on and the line-up included Chris Gibson and Vancouver guitarist Derek DiFilippo. Derek ultimately engineered and mixed the new CD, but has since moved back to Canada to continue his education. In 2004 Travis Metcalf joined as a full-time member. With this lineup and the recording of “King for a Day” came the new band name, reflecting the evolution of the band. And evolve it will. New music continues to appear. New challenges and new opportunities to expand the scope of ensemble music for the guitar. Atomic Chamber Ensemble is up to the challenge."